We were off to Osaka today. Originally I wanted to visit Osaka Castle early morning when there should be fewer people but my friend wanted to go off to a Virtual Reality conference back in Tokyo so we decided to skip it. It was going to be a pop culture day again because we were going to head straight to Den Den Town which was basically Osaka's version of Akihabara - lots of Anime, games, Manga pop culture goods. We also wanted to experience the Kansai dialect so instead of saying, "arimasen" they'd say "arimahen" or, "ooki ni" instead of "arigatou gozaimasu". I'm sure the Anime fans amongst you will have heard it before. Again, it was an early start because we wanted to get back early. We were going to be moving base back to Tokyo tomorrow so we wanted to get our laundry done before the night was over. Another thing you'll notice in Japan that shows how safe people feel is bikes aren't chained like back in the UK. They're just parked on their stands. One of the Pepper robots was standing outside a massage seat shop and it was the first time I saw one. It felt very automated... It did have face recognition and followed my face though, lol. It felt more of a novelty than of actual use. Den Den Town was loosely around Shinbashi Station. Not Monster Hunter related but pretty cool anyway. Nice to browse around the local shops. Takoyaki machines. Always fun to watch the chefs making those ball puffs so quickly. Came by this store that sold lots of traditional utensils including Bentou boxes. They were all wooden so you can't put them in the microwave or dishwasher though. I wanted to buy some Japanese chopsticks because I felt they were better to dine with. We used to have pointed chopsticks too but somehow they became rounded. There was such a huge selection. Even Pocky themed chopsticks! Aaand I think we reached the Den Den Town area. There are quite a few retro game shops around here with old console cartridges all shrink wrapped. Mizuki Nana releasing a music video collection I think. Old PC parts being sold. 2000JPY (13GBP) for a Geforce 9800GT. There's a warning that there's no guarantee they'll work though. Graphics cards are huge beasts these days. Probably 4 or 5 old PCI graphics cards put together. There can't be enough Steins;gate art - or should I say, huke? Felt like I was in a mini version of Akihabara. Huge posters everywhere but a lot less busy. K-Books was closed for spring holidays unfortunately. Cosplay wigs section. 5500JPY (35GBP) for Yukari's hair wig from Persona 3. Had some Owari no Seraph clothes for 6500JPY (41GBP) and the Shanks one costs 12,000JPY (76GBP). Owari no Seraph was quite a good show and interestingly enough, same producers as the Attack on Titan Anime, Wit Studio. Would be nice to see a third season since the second one didn't really wrap up. Steins;gate Zero posters on the floor everywhere. I've still to play the any of the spin off games like Phenogram. This was supposed to be a proper sequel to the first game. Upstairs there was a whole floor dedicated to trading cards. I didn't see any Pokemon cards. Mostly Yu-Gi-Oh. Then there were cards that were from visual novel games. At the back there was the over 18s section. You can see lots of naked, barely censored posters around and people casually browsing around. Interesting sculpture when you got to the top floor. Think it was a giant wasp. The maid cafes here offer massage services. 3000JPY (20GBP) for the first 30 mins. Don't think the maid cafes back in Akihabara offered this. So you could get a hand, feet or body massage or... Sleep on their laps. Seriously. Didn't think I would actually see one but spotted an actual Itasha - a car with Anime decals on it. Literally means "Painful Car" but comes from the Japanese words for "Itaria-sha [Italian Cars]". Didn't recognise the character though. Wasn't long before it was lunchtime and we happened to spot this Animax Cafe so we thought why not drop in. Been to a maid cafe and wasn't impressed. Let's see what an Anime themed cafe was like. Like its Animate chain department stores, the cafe can be found all over Japan. There's one in Tokyo too in Ikebukuro so you don't have to go all the way here to visit one. One common thing I noticed with restaurants in Japan was they always have these baskets for putting your bags in rather than the floor. We didn't know during our first visit to a Western Japanese restaurant and when we were about to put our bags on the floor the waiter said smiling, "Oh no, please use this" and held baskets to let us put our bags in. Considerate eh? I haven't been to a place that does this in Scotland. Apparently the theme was Noragami today. Order a drink and get a random coaster featuring one of the Noragami characters. Or one of the snacks for a luncheon mat. While waiting for food, I went around shooting a few photos which was permitted. There were autographs of the voice actors on display and were the only items you weren't allowed to take pictures of. It was completely empty so didn't have to worry about censoring faces out, lol. There were episodes of the show on. Story has the familiar setting of a secret organisation keeping the world safe from demons only certain people could see. Noragami happens to be one of the rogue gods who has taken to turning a good page and does odd jobs like fixing toilets for 10 Yen. It's a fun comedy, action show I can recommend if you haven't seen it yet. Food turned out quite delicious. I actually didn't see the menu about a free coaster with every Noragami themed drink. Fortunately my friend was thirty so he ordered another one, "Kofuku's Drink - White Water". It's like a sweet sugary drink. It was cosy here. No overly exaggerated role playing or silly games like the maid cafe we had been to. Just a regular restaurant but surrounded by Anime art that you could enjoy while eating. Staff were very friendly. Pricing wise there was a service charge of 500JPY (3GBP) for every 1 hour you stayed. For the two plates of spaghetti and three drinks, the final bill was 5300JPY (35GBP) which wasn't too bad. Hourly service charge seems to be a common thing in themed restaurants although somehow I don't think you'd stay longer than an hour or two anyway. I was quite temped to get some of the Animax Cafe exclusive goods there. Friend wanted to get the t-shirts but didn't have his size. If you needed more confirmation you were in Den Den Town, it wasn't far. Whole army of Storm troopers. Had yet to see the new Star Wars movie. It was available on the plane but I just watched Anime on my phone instead, lol. There were the usual figure stores but I wasn't really interested in getting any. I think some are really well sculpted with plenty of detail on them but, would have to be something that really caught my eye if I was going to get one. Like the Nendoroid Miku I had back home, lol. And there were Ghibli goods available as usual. Their merchandise really is everywhere so even if you don't get a chance to visit the museum, you can buy the non-exclusive goods in the toy shops. One figure store had a whole floor dedicated to Gundam and had this awesome fist bursting through the wall. Minecraft had its own fair share of followers as usual. I read Medialand (now Hyper Media Shop) had the best prices for video games and had tried to find the store in Akihabara but it was gone. Now I found one here. Their prices weren't that much different than the other chain stores but, I did pick up a copy of Falcom's Tokyo Xanadu in its original packaging instead of the budget "sakura" version. It was definitely a lot more quiet around here than Akihabara. The tourist info centre was filled with Anime mascots. Nippombashi was nicknamed Pombashi apparently. Air cans for cleaning out your keyboard and PC parts featuring Miku I think... Or a look-alike. There was this tax free store packed full of mainland Chinese tourists. We went inside to see what they sold and immediately the Japanese staff demanded to see our passports for some reason... We left quite quickly since we didn't feel very welcome there and there wasn't much to see. Taito arcades are pretty much everywhere with lots of crane game machines or "UFO catchers" as they're known in Japan. Dropped in to see if I could find the Dissidia game but didn't. Wasn't too bad the Final Fantasy fighter when it was released on the PSP. This was kiiind of cute and disturbing at the same time. Looked like decapitated heads of the Idolmaster girls but if you looked closer, they had hands, lol. Quite enjoy the iM@s games - at least the first PS3 game. At a glance they might look like some kind of dating sim where you just chat up the girls but, it's a very challenging management sim with some fun mini games. Death Parade's OP "Flyers" was on this rhythm game machine. Was a great show although the first episode was quite gorey. It was about people being judged after death, usually in a pair where they are forced to play a game. They don't believe they're dead and instead, believe that one of them will die if they lost so, it was a game to test who truly had the good personality even in the most desperate of times. After spending some more time around Den Den Town and picking up some games, I left towards Abeno Harukas which was Japan's tallest sky scraper and had an observation deck. I actually liked FFXIII. It was different, you didn't have full control but it worked. Can't say the same for the spin-off games though. "Manner Stations". Example of "gairaigo 外来語" which are basically foreign words that have different meanings. There are plenty in Japan like "mansion" means apartment/flats or "yell" means to cheer. In this case it was a smoking area. Japanese phones had a "manner mode" which was basically silent mode. So if you want to ask a Japanese to mute their phone, just ask them to use manner mode. No one talks on phones on the train or even chat. Or if they do, mostly in low, quiet voices. Very much enjoy the peace and order. Back in Scotland, it's very noisy. Usually young folks messing around. Of course, you'll always come across the odd exception though. The skyscraper is 300m high which was about half the height of Tokyo Skytree (pictured far right) but you're not crammed with busy crowds. The main observatory deck was 260m above ground on the 59th floor. Skytree's first observatory is 90m higher. I went there during the day and the view wasn't that great. Might have been better at night. There was some kind of Detective Conan exhibition going on. Think it was to promote one of its movies, "Darkest Nightmare" because there were panels everywhere introducing it. Some exposure for the skyscraper itself I'm sure. Well, time to pull out the Gorillapod. You had to follow one of the attendants to reach the full 300m height via the 59th floor but, I was more interested in taking photos before the last Shinkansen was due. Either I was at the wrong spot or the night view wasn't really that impressive with the white and orange little dots of lights. I must have simply presumed all night scenery are amazingly neon lit like the ones along Hong Kong's Victoria Harbour or Tsim Sha Tsui... Clearly not but it was nice to see Osaka's skyline all the same. I guess that's why Hong Kong's harbour is such a popular with tourists - especially for those who enjoy night life. I don't know about the ladies toilet but the gents toilet here had the same kind of view - full height glass walls for enjoying the city view as you walk in and out. Dubai's skyscrapers have glass walls in their toilets too apparently. Well, think I will want to spend more time in Osaka too if I ever travel to Japan again. Haven't actually seen much of the city other than the pop culture side of things. Tennoji Station had some interesting lights in the subway. There was another train decorated with a cartoon character but not an advertisement this time. Tips on how to handle hay fever like washing your hands and keeping a good mask on. Wearing a mask in Asian countries is part of the culture that you won't see back in the UK. Got hungry so bought some onigiris from the station store. Funny thing in Japan is sometimes while you're browsing the shelves you'll see someone restocking them from the back. Actually from the back of the shelves like they just lifted off the back or something. Back in the UK, the staff always stand with lots of crates next to them whenever they have to re-stock something. This was such a much more efficient way of doing it and gave more room for customers. And again, I ended up getting the Kodama Shinkansen back because it was late. Except this time I had a Green Seat reserved. Not that it made any difference during this time of night. It was either the Kodama or I pay for the Nozomi to get back faster. Some conbini snacks for the night. Pombashi guide I picked up in Den Den Town. Cute, eh? And stash for the day. Bunch of second hand games. They showed me every single disc and cartridge to make sure I was satisfied with the conditions before I paid. All were in "A" mint condition - the best you could get so all were good. 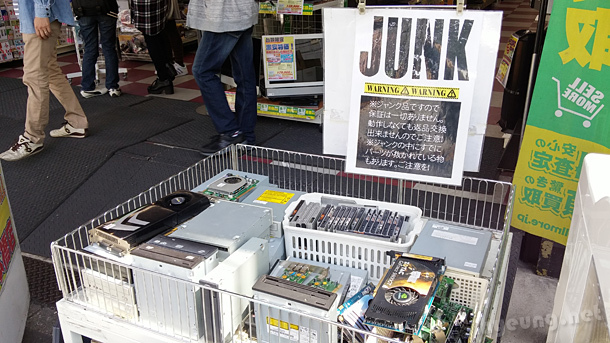 Unlike back in the UK where all the second hand games are just labelled "second hand", Japanese stores are more detailed with ratings and listed if anything was missing such as manuals or disclaimers about whether any digital bonus codes are still valid. The other thing about shopping in Japan as a tourist is that if you spend over 100,000JPY (approx. 70GBP) you are eligible to pay tax free if you show your passport. Spent well over that on the games here, lol.